How to make Fluffy Slime with Saline Solution, a slime recipe alternative without using borax or liquid starch. 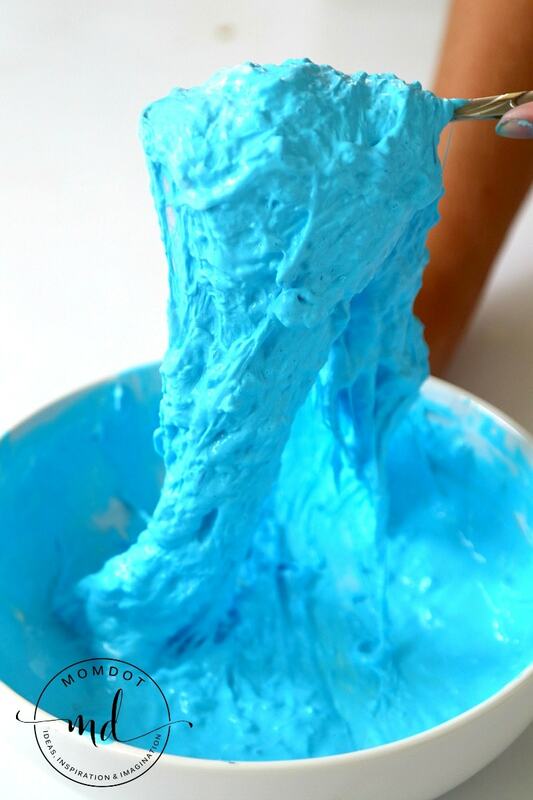 Learn below how to make easy fluffy slime with saline solution and baking soda. Welcome to slime headquarters. If you have been here before, you are already well aware of our tons of amazing slime recipes that have been part of the viral slime craze this year. This is why I am excited to bring you this new one: How to make Fluffy Slime with Saline Solution! 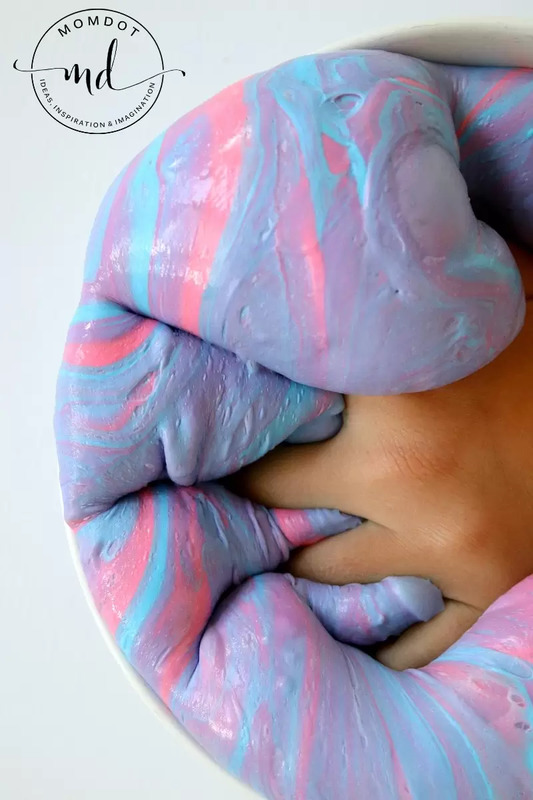 There are tons of recipes on how to make slime from how to make fluffy slime (without borax), to striped slime, even rainbow slime and unicorn poop slime! No matter which insane slime recipe you are looking at, this is a sensory experiment that changes every time you do it, which makes slime fun and exciting. Before you get started on how to make fluffy slime with saline, you will need a few things! Its always best to be prepared. I buy all my slime supplies on Amazon and here is a list to help make your life easier. Now you may have read our other how to make saline solution slime recipe which doesn’t include shaving cream or our other saline solution fluffy slime recipe which is a variation of this one and there is no wrong or right way to make slime. Slime is an experiment and every person that play with slime will prefer it to be stretchy or bouncy or thin or thick, its really up to the maker. For this fluffy slime, its a really poofy less stretchy slime that is fun to punch with your fingers and push in with your toes. In large quantities, its super fun to play with and is less messy than traditional fluffy slime with shaving cream. Pour 1 cup of white glue into a bowl. Add 1/4th cup water and stir until combined. Add approximately 1 cup of foamy shaving cream and stir until combined. Now add 1 tsp baking soda and your color dye.Once you have your color and your glue ready, its time to add your saline solution. In our experiments on how to make Fluffy Slime with Saline Solution, 1/2 tablespoon saline solution has a better finish. The catch is its messier up front and you will stir and knead longer as you can see with the in between images below. You add to your saline solution to the bowl bowl and stir. It will look like a mess. Keep stirring. Once the sides of the slime start to form away from the bowl, you can go to kneading in your hands. 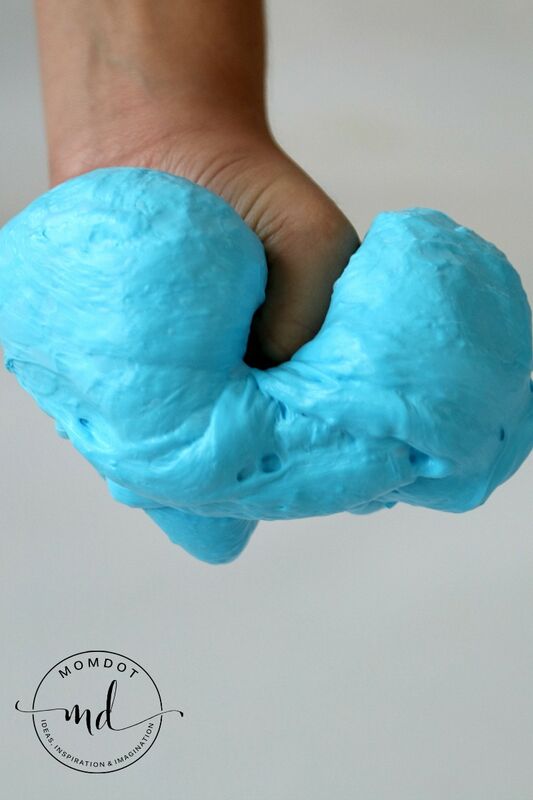 Roll the slime around your hands and back and forth until it no longer sticks to your hands. This can take approximately 5 full minutes. You can add 1 tablespoon of saline if you prefer and it will become bouncier and less stretchy. Once your slime no longer sticks to your hands, its ready! We love to make several times of slimes and slime colors and then combine for the ultimate super fun fluffy slime! We followed the recipe and it just kept sticking to my daughter’s hands…it never came off..after way more than 5 minutes. Her friend kept saying “add borax” but we didn’t. I wonder what we did wrong?